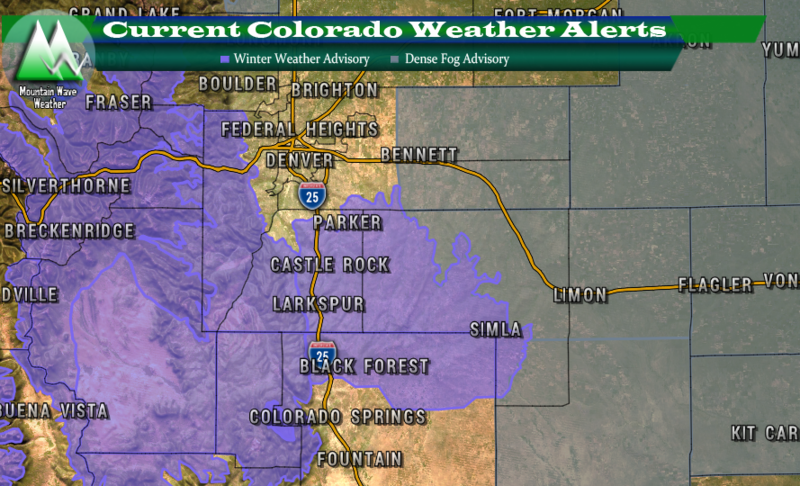 You can view Castle Rock specific Weather Warnings on our Page Here! Everything for the most part seems to be on track with this storm with the data coming in this morning. Models are still showing a system moving in this afternoon, initially with rain showers (and even a few thunderstorms) and changing over to snow at some point. The instability in the atmosphere will lend itself to some areas seeing short and intense bursts of snowfall (very similarly to the last storm) so be prepared for that this evening. 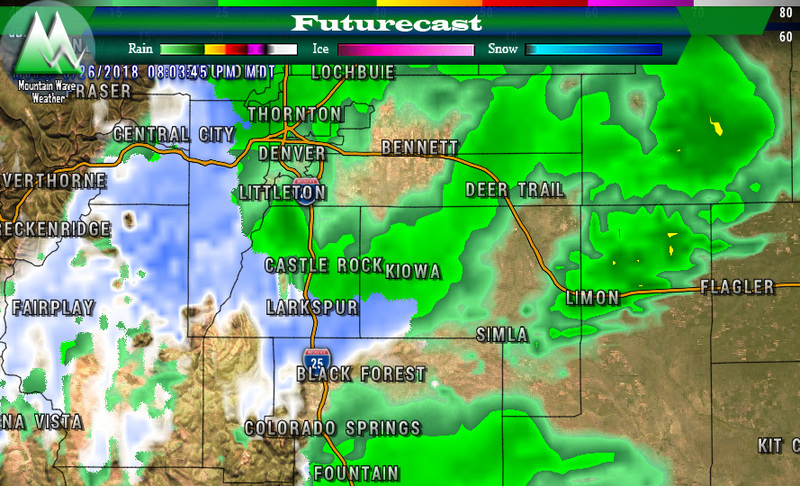 Notice the fine line between rain and snow setting up somewhere South of Castle Rock in the early evening hours. Where this line ends up and when it ends up there will be very important to how much snowfall we see. Models can spit out expected snowfall amounts all day, but they sometimes struggle with pinning those amounts down when you have fine temperature line like that. It’s the main reason we see so many busted forecasts (both high and low) in the spring months along Colorado’s front range. By later in the evening hours we transition all to snow, this time period could contain intense bursts of snowfall, strong winds and low visibilities… much like the last storm. Travel conditions will deteriorate into the evening and overnight hours. First thing you’ll notice is the ranges are a bit wider than our past storm’s forecast. Again this is because the temperature setup and atmosphere are slightly different and depending on exactly when things change form rain to snow makes the difference as to whether you’ll see the higher or lower end of those snowfall ranges. Rain will start moving in after 2 or 3 PM on Monday. 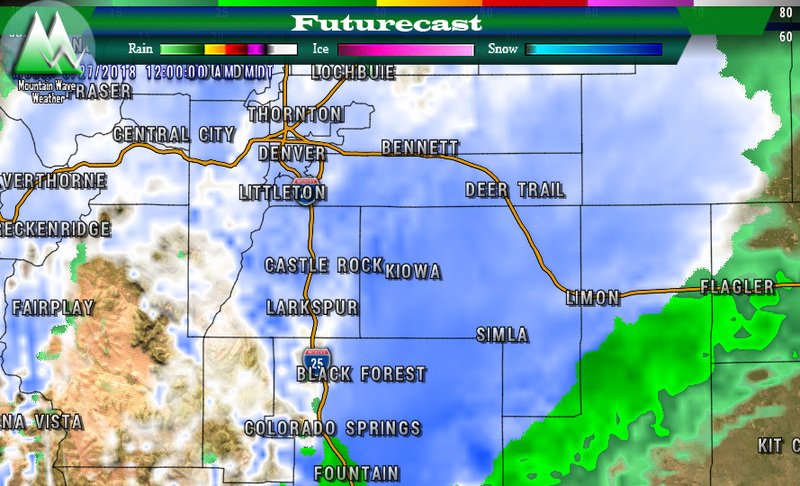 That precip should change over to snow as you make your way towards the evening hours. Remember, the Palmer Divide will change over fast than lower elevation areas like Denver. Probably a good idea to have everything wrapped up and be off the roads by 8PM. Just like the last storm, any areas under intense bursts of snowfall will see road conditions deteriorate quickly. Expect slushy and icy roads especially in the evening and overnight hours. I suspect the Tuesday morning commute will be impacted at least moderately, especially on the South side of town. Lots of similarities with this storm and the last one we had, but some differences too. I don’t think we will see quite as much snow as the last storm but accumulations could be close if the rain changes over sooner. Of course, this entire forecast is riding on the low pressure systems to set up correctly and take the right track. Any wobble in those could make a big difference. Be sure to stay tuned and we will pass along any updates we see with this storm. Be sure to stay tuned for other updates as well as there are potentially 2… YES 2… more storm systems slated to impact our area this week. Each of which could bring snow and much needed moisture! Thanks for the post. I look forward to the storms and your explanations of the forecast. I’d love to see Monument included in your snowfall forecasts and snowfall reports.